One of the biggest legends in boxing history turns 69 this week. 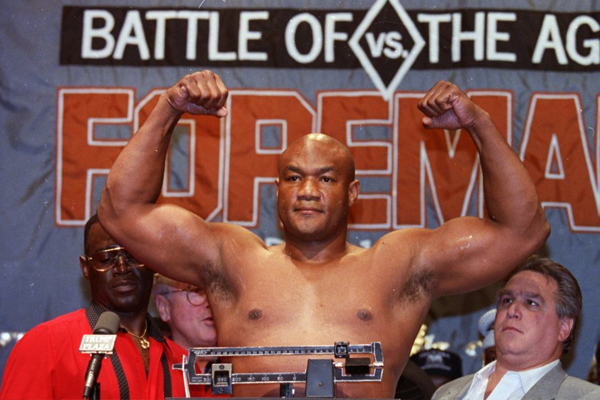 On January 10, 1949, Big George Foreman entered the world in Houston, Texas. By 13, Foreman was already well-known and feared in the roughest part of the city. A boy in a grown man’s body, he was notorious for knocking out and robbing adult men. Lester Hayes, one of the roughest defensive backs in NFL history, grew up in Foreman’s neighborhood, remembering him later as the scariest bully on the block. Understand, even by the standards of elite heavyweight boxing, Foreman was an incredibly imposing figure. Along with Sonny Liston, he has the largest hands every measured on a heavyweight champion. In his prime, he stood 6’4″ and a chiseled 220 pounds. As an older fighter, he was still very well-conditioned at 255. Like many all-time greats, Foreman was saved by the Sweet Science. In less than two years, he went from budding gangster to Olympic hero, winning a Gold Medal at the 1968 Olympics, after a ridiculously short amateur career. Foreman stepped into the company of the immortals when he blasted Smoking Joe Frazier in just two rounds in Jamaica in January 1973, to capture the Heavyweight Championship of the World. It remains one of the stunning performances in the history of sports. Frazier was himself a dominant heavyweight champion–an all-time elite in the division, undefeated and still very much in his prime. Foreman’s Waterloo came in the jungle in Zaire in October 1974, when the Greatest, Muhammad Ali outlasted his fury and knocked him out in Round 10. Foreman retired in 1977, following an upset loss to the crafty Jimmy Young. If that had been the last we ever saw from Foreman in the ring, he would still be in the books as one of the best heavyweights to ever climb into the ring. But a full decade after hanging up the gloves, Big George launched the most amazing comeback in the history of professional sports. Against all odds, Foreman once more emerged as a top heavyweight. In April 1991, he challenged for the Heavyweight Championship of the World, losing a classic battle against Evander Holyfield. He still was not done. In November 1994, less than two months before his 45th birthday, he knocked out Michael Moore to regain the World Championship. In his second career, Foreman transformed his public persona, going from one of the sport’s most feared characters to one of its most beloved. He remains not only one of the most interesting figures in boxing history, but in American history as well.